One of my favorite things is meeting exciting new American Indian artists when they’re at the beginning of their careers. 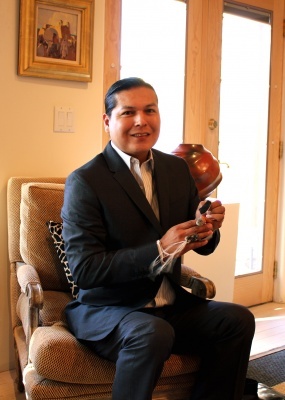 Navajo artist Orlando Dugi is one such person. Originally a beadworker, Dugi’s fresh artistic career has spanned from clothing to handbags and most recently, jewelry. All of his creations are tied together by their contemporary elegance and luxurious feel. It is almost as if Orlando Dugi has an innate love of high fashion that has transferred into his work. At the young age of 4, Dugi was already admiring Navajo ladies at traditional ceremonies, who wore their beautiful velvet garments and silver adornments. Orlando Dugi’s early love of clothing and accessories expanded far beyond the Navajo world, though. Orlando remembers that while growing up in rural Grey Mountain, Arizona, he dreamed of visiting grand centers of style like Paris, Rome, New York and Tokyo. The elegant yet elaborate designs of Yves St. Laurent and the straight, clean lines of Prada continue to influence Orlando Dugi to this day. His resulting body of work, therefore, has a completely different asthetic from traditional American Indian artistry. Dugi most admires evening wear, so his designs, whether they be clothing or jewelry and accessories tend to be fancy, dramatic – pieces that could be worn to the Santa Fe Opera or the Academy Awards. In fact, one of Dugi’s beaded handbags was actually worn on the 2011 Academy Award Red Carpet by American Indian actress Kateri Walker. She intended to wear one of his extravagant dresses too but it got held up at the last minute in alterations. Dugi often uses druzy quartz in his jewelry because it adds such sparkle, lustre, and opulence. Just look at these glamorous peach Brazilian druzy quartz earrings. One of the things that strikes me most about this polished and stylish artist is that he has been working for such a short time, yet he is already so good. 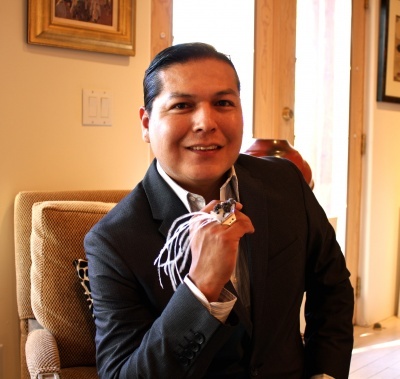 Dugi’s first year at Santa Fe Indian Market was 2010, where he won First Place in the SWAIA Clothing contest for his “In Full Bloom” hand-beaded evening gown along with First Place for his “Celestial Phoenix” evening box purse collaboration. Add to that the fact that Dugi has only been creating jewelry for about a year, and it’s impressive. Everything that Orlando creates is handmade and entirely one-of-a-kind. He hasn’t attended any formal jewelry making classes and instead considers himself self-taught. Interestingly, his father was a silversmith, and Dugi has made some advancement in his jewelry making by simply recalling visual images of his father at his bench working silver. I expect Orlando Dugi to go very far in the art world. He says that his jewelry designs are already evolving in new directions, so it is exciting to think of what he will come up with next. Before long, we just may see Orlando Dugi and his work in New York or Paris.